Tucked away on 300 tropical acres between Miami and Fort Lauderdale, Turnberry Isle Miami is a tropical oasis with a culture of authenticity and an itinerary of enriching experiences. Named one of the “World’s Best Resorts” by Travel + Leisure Magazine, and a Forbes 2017 recommended resort, Turnberry Isle Miami is a South Florida treasure. The resort is renowned for its two championship golf courses redesigned by Raymond Floyd, celebrity chef Michael Minna’s award-winning BOURBON STEAK restaurant, the elite Cañas Tennis Academy and the engaging Turnberry Kids camp. Fresh features on property include dining destination CORSAIR kitchen & bar and the newly renovated three-story âme Spa & Wellness Collective. All the above, and two relaxing pools to boot, are within walking distance of their 398 spacious guest rooms and suites. The Mediterranean-style resort is surrounded by a 2.9-mile nature walk and offers easy access to the beach and Aventura Mall. HISTORY: In 1967, developer Donald Soffer envisioned transforming 750-acres of North Miami Beach into a luxury residential area brimming with amenities. He sketched out his vision for this utopia on a cocktail napkin and the rest is history. Decades later, we now have the vibrant city of Aventura. At the heart of Aventura is Turnberry Isle Miami, a five-star luxury resort and membership club offering first-class accommodations, fine dining, championship golf, a cutting-edge spa, and leisure activities for the whole family. The resort was built in 1970 and is still owned by the Soffer family through Turnberry Associates. The main building and the master plan for the entire resort were carefully developed around a 100-year-old Banyan tree to enshrine and celebrate the incredible natural environment of this special place. In December 2007, a $150 million resort-wide renovation was completed. A further $2.5 million renovation and re-design of the spa facilities and wellness programming at Turnberry debuted in January of 2017 with the opening of the new âme Spa & Wellness Collective. ACCOMMODATIONS: The 398 guest rooms include 27 suites that range in size from 500 to 2,500 square feet. The resort has three presidential suites and five apartment-style suites. All rooms have hardwood floor entries, carpeted bedrooms, exquisite linens, the finest furnishings and art. Each guest room features a terrace with views of the resorts golf courses gardens and/or pools. 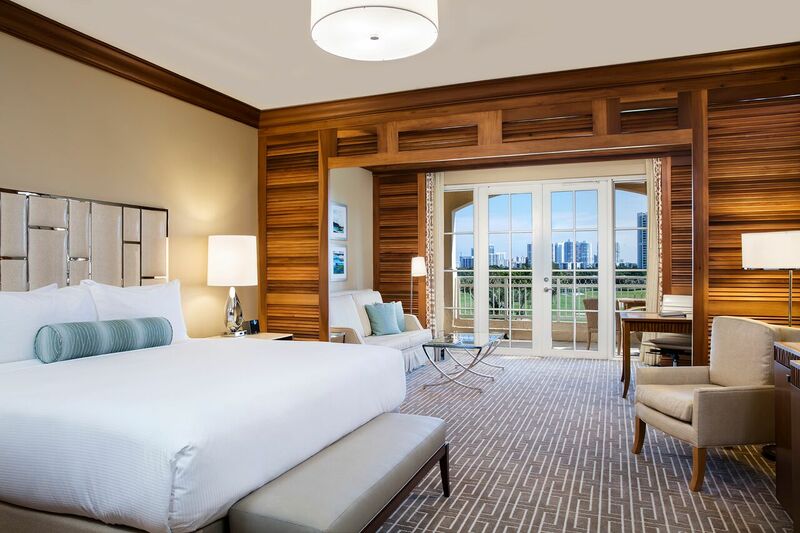 Reviewers on TripAdvisor often comment on the size of the rooms as even standard size rooms at Turnberry Isle are enormous! FINE DINING: With critically-acclaimed restaurants, resort guests and club members never need to leave Turnberry Isle Miami for an elegant evening and exceptional cuisine. At Turnberry Isle Miami, the best night out is often a night in. 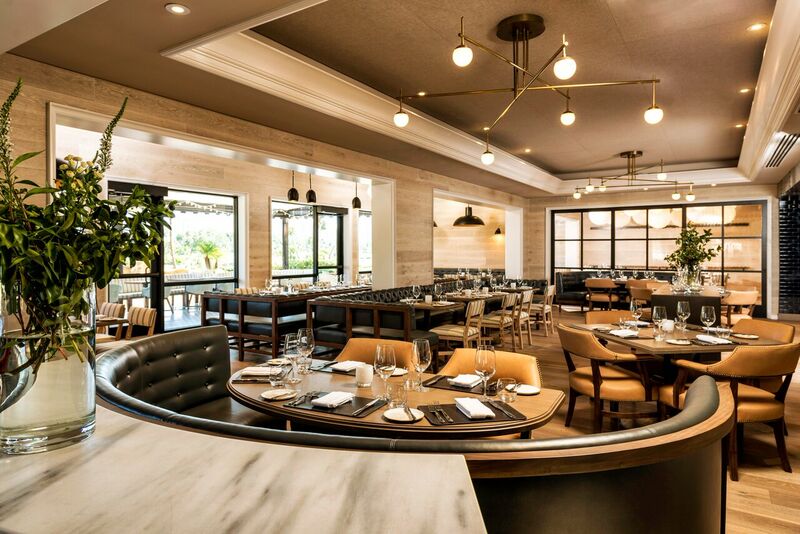 BOURBON STEAK—James Beard Award-winning chef Michael Mina’s modern American steakhouse at Turnberry Isle Miami—offers a timeless dining experience with all the grandeur and traditions expected of a steakhouse along with a few whimsical twists. All-natural, organic, and hormone free cuts of beef are tempered in herb-infused butter, then grilled over wood to order. Guests can choose between Japanese A5 Wagyu beef or American Wagyu and USDA Prime cuts. 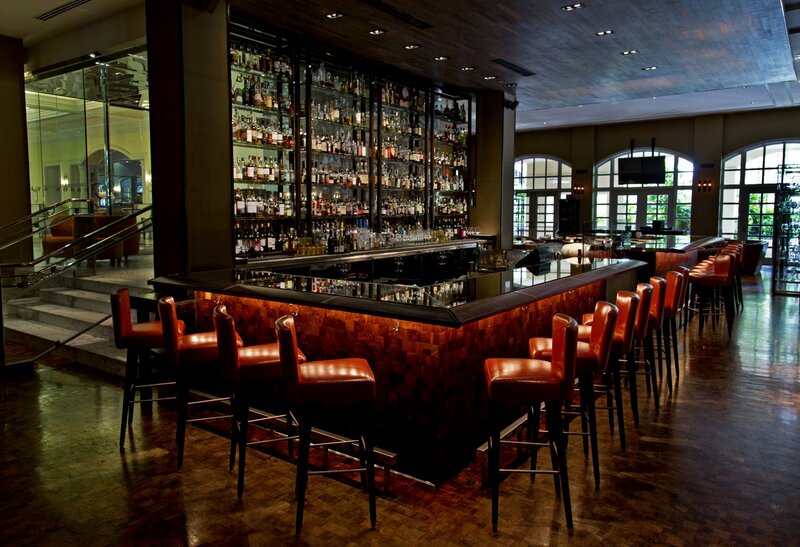 A Wine Spectator award-winning cellar offers more than 850 select wines, while the bar highlights classic American cocktails. 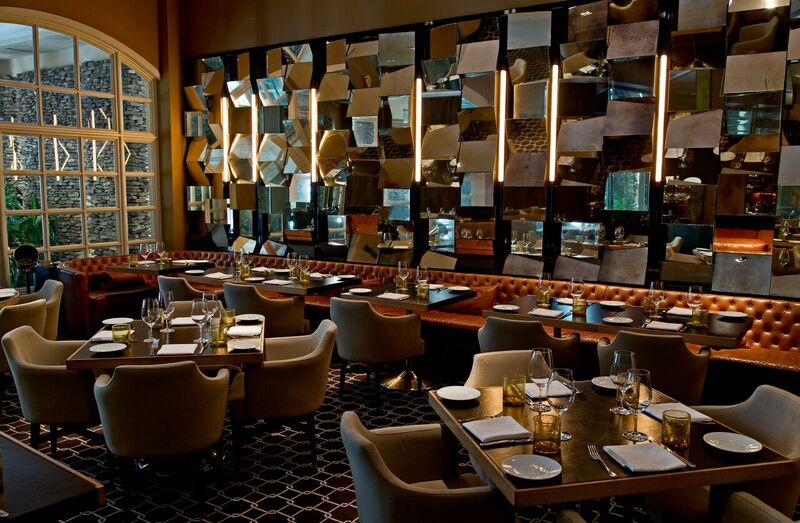 Imagined by designer Tony Chi, BOURBON STEAK offers refined, private dining rooms and the stylish Tastings Room for parties of up to 30 guests. CORSAIR kitchen + bar is an American-inspired kitchen and bar offering contemporary cuisine for guests looking for lighter comfort food. Its open kitchen offers authentic creations designed to satisfy your palate in a friendly, sophisticated setting. 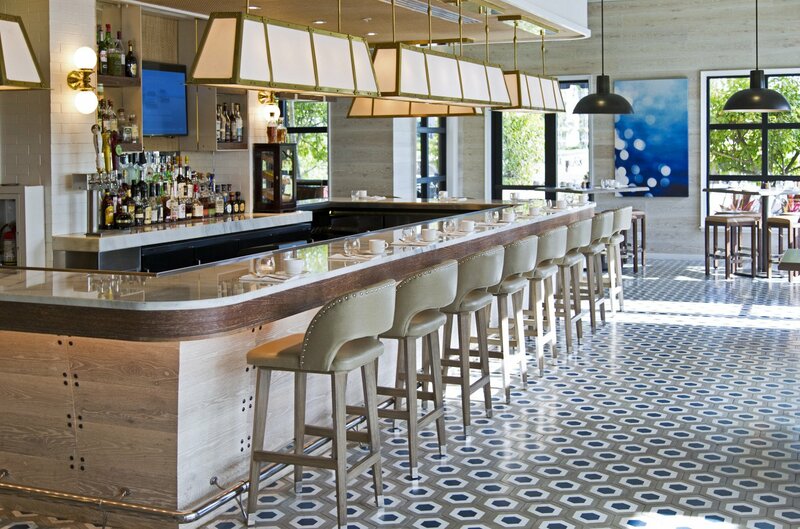 It is the perfect gathering place for breakfast, weekend brunch, lunch, dinner, after work, or a spirited night out. 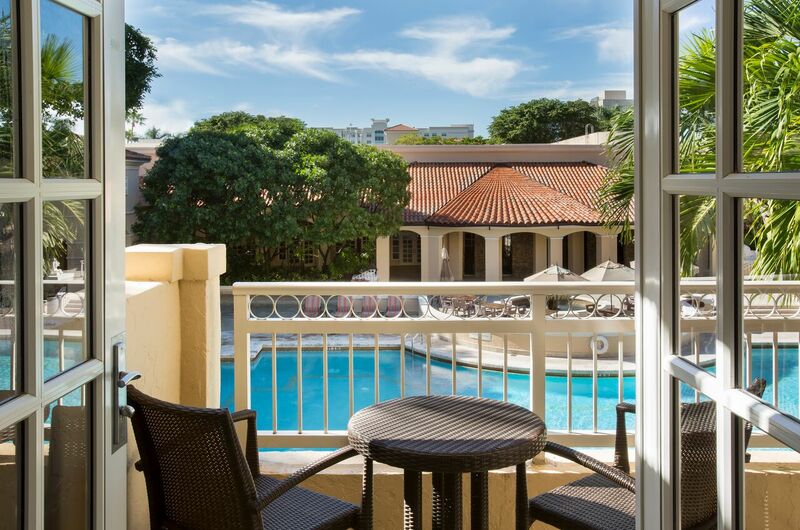 Beautifully designed, the casually yet elegant environment flows seamlessly onto an outdoor patio overlooking a scenic tropical oasis and the resort’s golf courses. At CORSAIR food is fresh, simply prepared and unlike anything else. LAGUNA GRILL offers poolside dining at the resort’s Lagoon Pool. The grill is luxuriously set on an outdoor terrace overlooking the pool’s magnificent waterfall. The menu features tropical island casual fare—with many tasty yet healthy dishes—as well as an assortment of specialty drinks, beer and wine. It’s also and ideal option for vacationers looking to soak up every bit of sun they can get, and for families with children who do not want to leave the fun of the pool. The Lobby Lounge offers small plates, drinks and an opportunity to catch up with friends, family, and colleagues in the main lobby. The Onyx Bar, located at the secluded Cascata Pool, features light fare and specialty frozen drinks. In-Room Dining is available for resort guests 24 hours a day, 7 days a week. A wide range of catering options including Kosher, Vegan, Vegetarian and Paleo menus are available for corporate events, private parties, and groups utilizing the resort’s expansive meeting and special events facilities. Turnberry Isle Miami is renowned for its 36 holes of championship golf featuring the Soffer Course and the Miller Course. Turnberry has a 4 star rating from Golf Digest Magazine and was named the “2012 Golf Resort of the Year” by the International Associations of Golf Tour Operators. After a $45 million redesign and renovation by Raymond Floyd, the Soffer Course debuted in December 2006 and the Miller Course opened in December 2007. Originally designed by Robert Trent Jones, Sr., both courses offer lush, tropical grounds accentuated with a variety of elevation changes, contoured fairways, sharp changes within holes and strategically placed water features that ensure water comes into play on almost every hole. Varied flora and trees indigenous to Florida’s tropical climate create an oasis-like feel throughout the courses giving each hole a private feel, with more than $100,000 in landscaping spent on each hole of play. Occasionally, a beautiful sculpture can be found nestled within the foliage, reminding golfers that art and natural beauty surround them at every turn. ÂME SPA & WELLNESS COLLECTIVE: In January 2017, Turnberry Isle Miami opened the âme Spa & Wellness Collective. The new luxury full-service spa is the result of $2.5 million facilities renovation and a complete re-design of Turnberry’s wellness program. The innovative program was curated by an international “collective” of forward-thinking practitioners at the vanguard of both Eastern and Western modalities. The spa offers wellness and nutrition coaching, fitness programs, spa, and beauty services. Central to the spa’s philosophy is a highly-personalized approach for each and every spa guest. 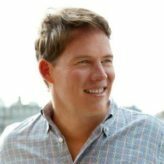 Rezilir Health™, a team of baord-certified functional and integrative clinicians, are onsite to create custom, sustainable health plans for clients to improve cognitive function, balance hormones, and manage weight. Physician’s Institute of Cosmetic and Reconstructive Surgery is also on call at âme for comprehensive consultations and noninvasive procedures. 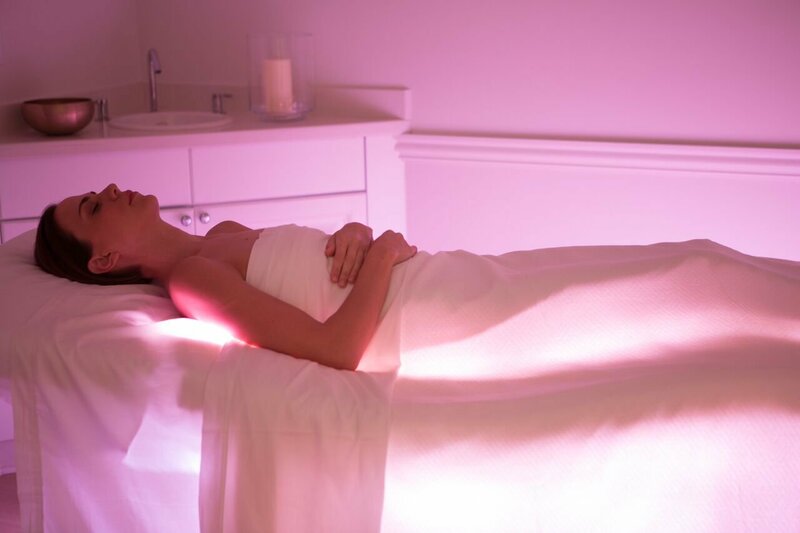 The spa menu includes more than 70 unique treatments designed to address both aesthetic and functional concerns with massage, exfoliation, aroma- and color-therapy, and more. Treatments include the traditional and the unconventional like the Japanese Iyashi Dome and Alisselle Amethyst Quartz Massage (created by Gharieni). âme’s salon offers haircuts, coloring, and styling for men and women, along with comprehensive nail services. Through Camp ÂME, the spa offers wellness travelers three-day-long retreats focused on nutrition, beauty, and fitness led by wellness experts. One day âme-azing Sunday retreats are also programmed regularly for guests and local residents. There are more than 96 classes offered each week including various styles of yoga, spinning, Pilates, and HIIT. The 20,000-square foot, three-floor luxury spa has 22 treatment rooms, a yoga studio, an indoor cycling room, a private Pilates room, and a weight training and cardio studio. Treatment rooms feature equipment from Gharieni, the premier innovator in spa technology. To view the spa menu, book spa appointments, register retreats and ÂME-azing Sundays, or to participate in regularly scheduled classes visit amewellness.com. Traveling with kids? 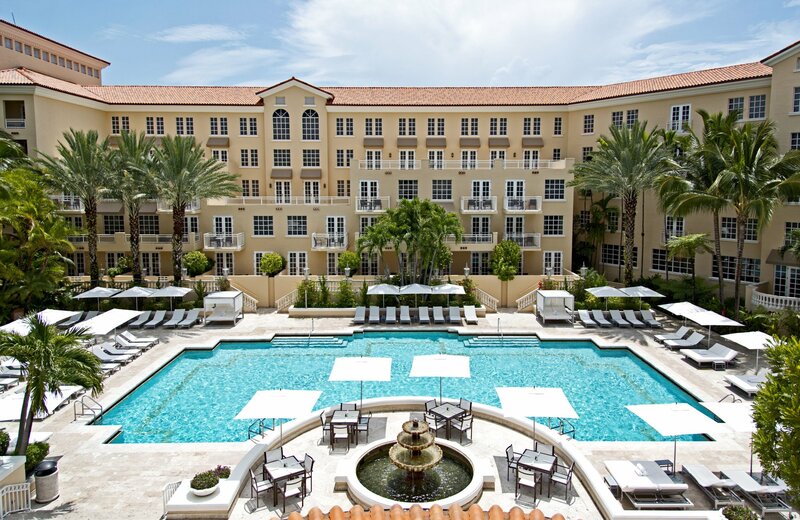 Turnberry Isle has you more than covered with their Turnberry Kids Club by PEAR Programs. Let loose your little ones as they play, create, and share with other vacationing kids ages 4 to 12 as they enjoy supervised, arts and crafts, sports and custom fitness classes. PEAR Programs is fully insured and all their counselors are fully trained and certified. And when school gets out in the summer, the kids program expands into a full on summer camp where kids can participate in a variety of innovative activities including sports, visual arts, performing arts, team building and more. Of course, the enormous Laguna Pool is another way to keep the kids busy and happy all day long. The only lagoon-style pool of its kind in South Florida, Turnberry’s 7,500 square-foot Laguna Pool invites days spent splashing and soaking up the Miami sun. A 1,600-foot long lazy river, 35-foot high waterslide and splash pool let both kids and adults lounge and play.